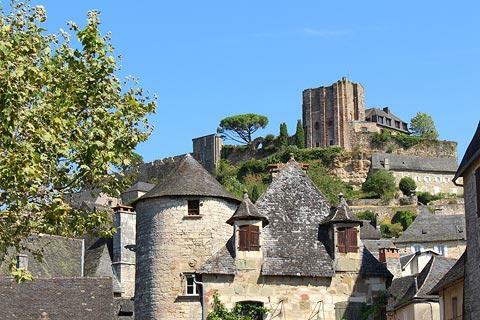 The pretty village of Turenne is 15 kilometres south of Brive in the Limousin region of France, and officially listed as one of the 'most beautiful villages of France'. 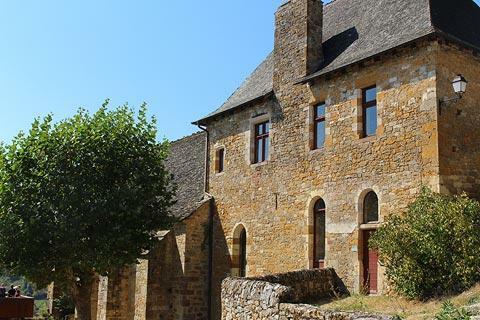 In total contrast with nearby Collonges-la-Rouge the stone used to build the houses in Turenne is not at all red - it's amazing what a difference a few kilometres can make! 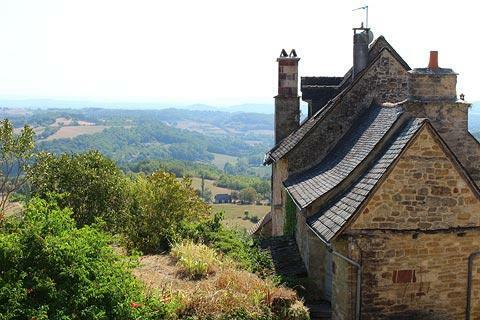 A pretty village with lots of unspoiled traditional Limousin houses, Turenne sits on the edges of a small hill and as a result there are some lovely views from the top of the village across the Limousin countryside and forests to the mountains beyond. 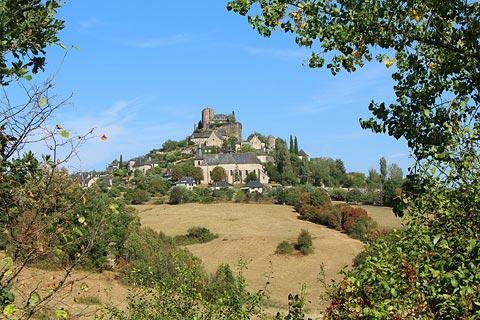 Although you might not find the hill so small if you climb to the top with small children on a hot day - it is steep! 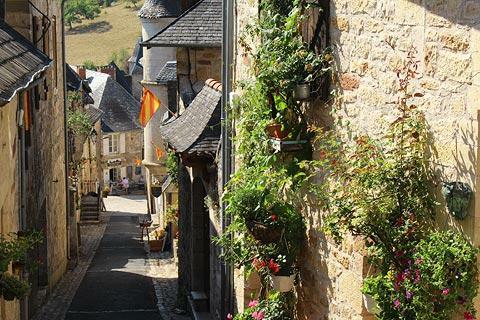 In fact there are two routes between the bottom of the village and the castle: a direct route straight through the village, which is steeper but has some shade, and a more gentle route to the right hand side of the village. 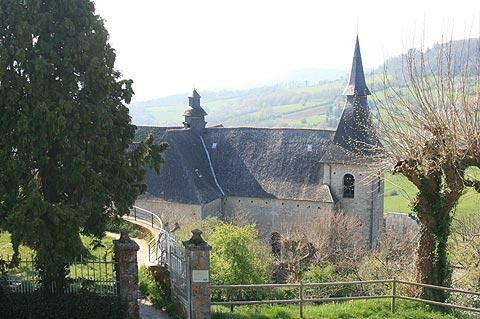 We prefer going up on the gentle path and coming down the steeper route! 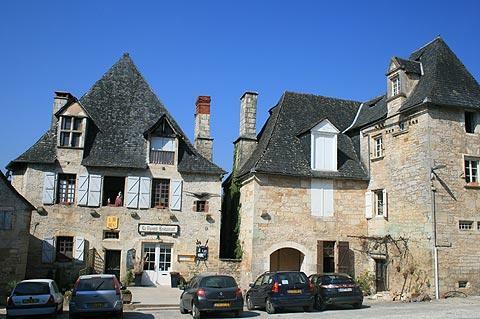 The pretty 13th century village has many lovely stone houses to enjoy, most of them built in the 15th and 16th centuries and frequently with individual highlights such as watchtowers that will attract your interest. 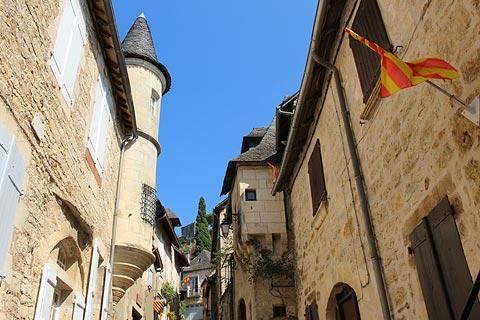 The narrow streets are also largely pedestrianised which makes it a pleasure to explore. 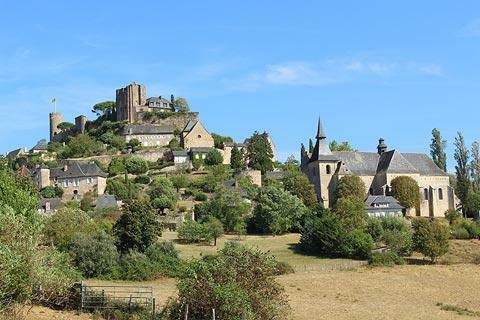 The towers that stand at either end of the hill behind the village will also attract your attention and are all that remains of the fortress that once stood on the cliff behind the village. 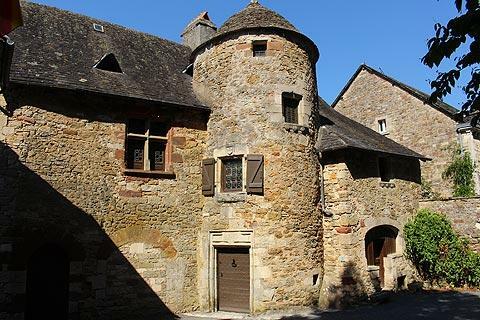 The circular 12th century César Tower is the older of the two while the square donjon tower was constructed some 100 years later. 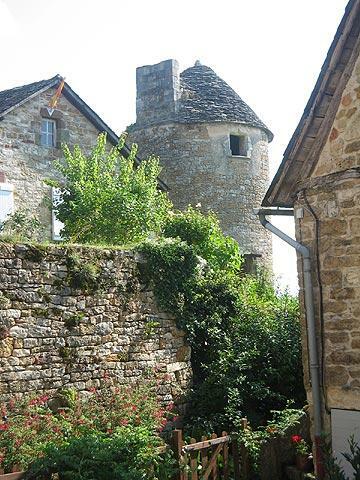 The towers are now separated by a nicely maintained garden and a substantial part of the original fortified wall of the castle. 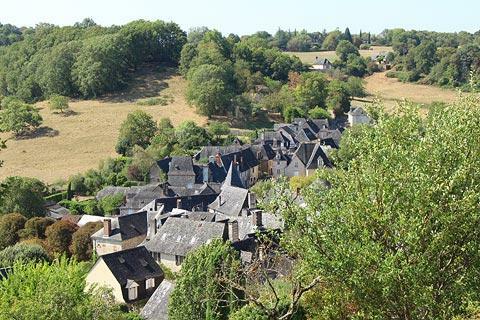 Looking down across the village from the castle is the best way to appreciate the lovely rooftops in Turenne and to see the conical roofs on top of the towers. 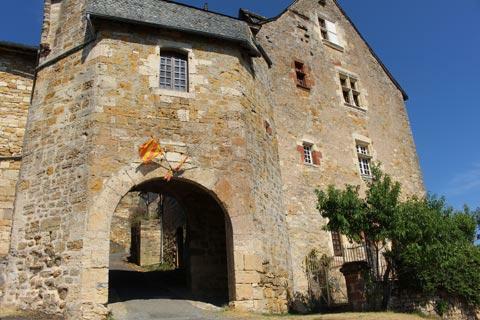 Elsewhere in the village when you follow the path to the right of the centre of Turenne you will see the Porte de Mauriolles, one of the original stone gateways that allowed access through the fortifications of the town, and the calvary Tower which was also part of these defences. 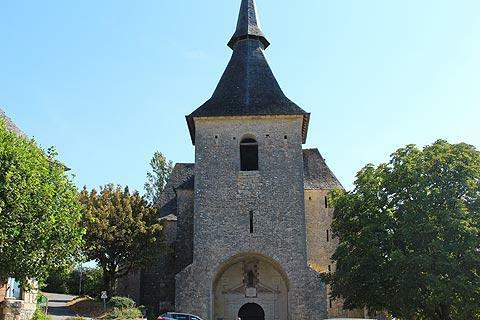 The Collegiale Church of Notre-Dame here is the most important religious monument in Turenne and was built in the 17th century: step inside to see the very decorative altarpiece. 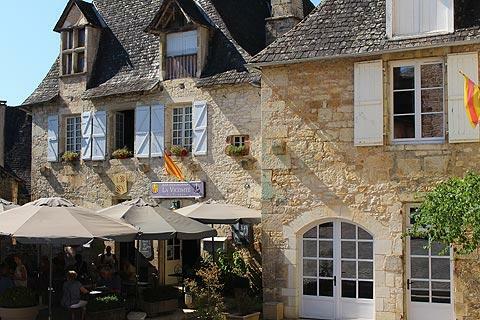 There is a choice of bars and restaurants in the village, both outside the historic village and within the Place du Foirail, the main square in the heart of historic Turenne. 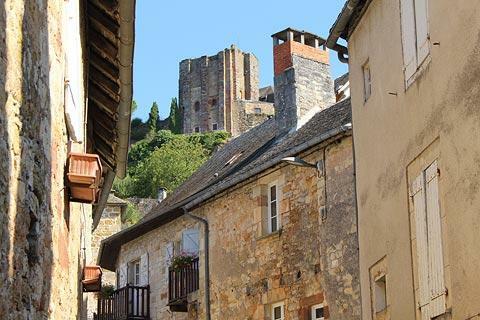 There is bicycle hire shop in the tourist office if you feel like exploring the area around Turenne. 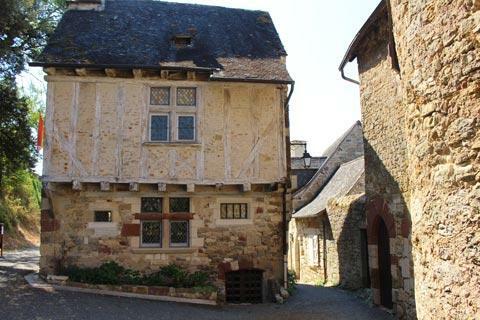 The village of Turenne is close to two other 'most beautiful villages' at Curemonte and Collonges-la-Rouge, and a day exploring these three villages is very rewarding - partly because they are all very lovely, and partly because they each show a different aspect of the local historical architecture.